An amplifier is typically designed to make a solid-body electric guitar sound louder. As the name clearly suggests, amplifiers help boost a weak sound’s signal. When it comes to amplifying the sound from an acoustic guitar, things are bound to get a tad complicated. When plugged in, the amplified sound from an electric guitar is designed to sound entirely different from its source. When amplifying the sound from an acoustic guitar, you will most likely prefer to maintain its natural tone and increase its level of loudness. What Should You Look for When Choosing an Acoustic Guitar Amplifier? Why Should You Buy An Acoustic Guitar Amplifier? If ever you find yourself in a unique situation whereby you need to get the most out of your acoustic guitar, you will probably need to incorporate an amplifier into the mix. Surely you can simply plug in your acoustic guitar into your Stratocaster amp, right? There is no harm in this, considering notable artists have done the same for their acoustic guitars with no problem at all. But if you wish to get that extra oomph from your acoustic guitar, then an electric guitar amplifier can, in no way, guarantee you that much-needed musical satisfaction. Why is this? When you play acoustic, you may probably want to amplify the guitar’s tone, which is majorly sourced from the methodically-picked tonewoods used in building the instrument. Like most instruments, acoustic guitars benefit a great deal from distortion-free sound and full-frequency reproduction. Solid-bodied electric guitars, on the other hand, sound better to a majority of individuals through a tube amplifier complete with a simple, traditional speaker with a paper cone. This is mainly due to their precise harmonic distortion and audible accentuation on mid-range frequencies. Like most PA systems and home stereos, most acoustic amps feature tweeter and woofer arrangements that are designed specifically for high-frequency and low-frequency, respectively. The main factor that puts acoustic amplifiers in a league of their own are the bonus specs that specifically cater to the needs of an acoustic player, such as extra inputs for onboard effects, mobile devices, and microphones. These and more features will ensure that you receive quality representation of your acoustic guitar’s natural sound. The best acoustic amplifiers have a one-of-a-kind ability to reproduce whatever sound you play on your acoustic guitar, low or high, with no form of distortion whatsoever. With that said, it’s important that you choose an acoustic guitar amplifier that suits your needs, other than wasting your money purchasing amps that other people are into. This point leads us to the age-old question of what to look for in a good quality amplifier for your acoustic guitar. It is essential for you to put into consideration what effects are going to be an integral part of your performance. If you’re a solo performer, the best way to lay down a track and add in your vocals is using the built-in loop function. If you’re looking for a more robust and richer sound, try out the built-in reverb. Additional effects include chorus, delay, and flange. Everybody has a different sound preference and that’s okay. As the signal transmitted from an acoustic guitar generally comes from a microphone or transducer pickup, the feedback possibilities are relatively high. To lower the chances of feedback, there is a feedback suppression function that is incorporated in all acoustic guitar amplifiers. Without a doubt, this is one of the most significant features you can look for in an acoustic guitar amplifier. Normally, this will include an XLR input, or maybe a phantom power option. The XLR input will turn your acoustic guitar amplifier into a self-contained, smooth-sounding, PA system. This unique feature will enable you to perform at gigs with zero chances of a full-blown PA system. Not sure if one of these amps is really for you? Well, if you’re on the fence about adding one of these amplifiers to your gear collection, then check out the video below. Acoustic guitars are classified into two: solid-state amplifier and tube amplifier. Solid-state amplifiers are the most preferred of the two mainly because of their reliability and crisp clean representation of whatever signal that is channeled through it. Tube amps, on the other hand, basically provide an ‘organic’, fat, and warm tone. They have a minimal level of maintenance, considering the tubes will have to be replaced over a long period of time. If you wish to run your acoustic guitar signal through stereo effects, a stereo amplifier would work out best for you. If not, just stick with mono. You’ll require 20-30 watts of power if you’re intending on practicing on a daily basis with a full band or solo in-house practice. 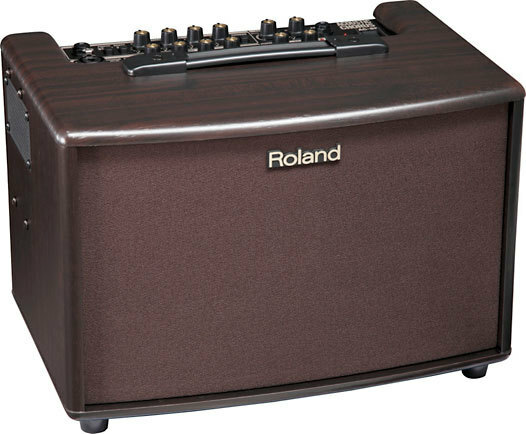 If you are going to be serenading larger venues, set your eyes on an amp that pushes about 50-60 watts. If you’re booked to perform with a full band for a considerable crowd over the weekend, go for a 100-watt amplifier. Prior to purchasing any of this equipment, you should already have a clear description of what you’re looking for in an acoustic guitar amp. 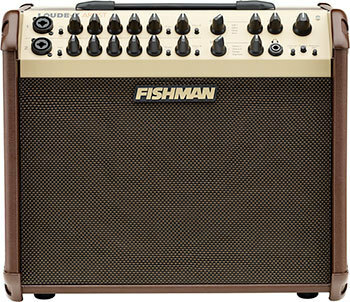 You may or may not have heard of the brand Fishman before. They are the genius company behind a host of electro-acoustic guitars. Now, they have upped their game and delved into the production of acoustic amps as well. The sound it produces is of high-quality, even when the gain level is high. Offers functional and highly reliable features. The cabinet material used is soft, making it vulnerable to tear and scratches. Its high price makes it impossible for some to afford it. It will take some time for you to get a hang of its settings. An all-around guitar amp. 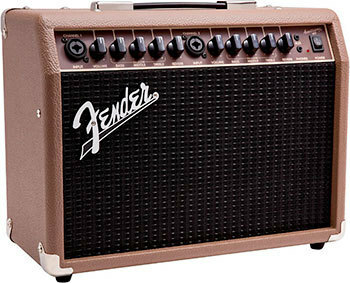 The Fender Acoustic Amplifier is considered a reliable tool in amplifying acoustic sounds as well as microphone inputs. It is a favorite when it comes to a wide range of musical performances such as stage performances, studio recording, and home practice. Your next guitar adventure would be incomplete without a Fender SFX Guitar Amplifier. It has Full Range ‘Voicing’, SFX technology and Digital Reverb that offer exceptional full tones that can be projected across a broad spectrum. It features easy-to-navigate controls. For each amplifier’s channels, there is a single volume knob, reverb/effects-level control and, a 3-band EQ. Its overall stylish design is pretty eye-catching. Can be transported from place to place with little effort. Everything about the THR5 combo is designed to deliver in terms of feeling and sound, both on and off stage. Its development was started from the ground up by a crew of guitarists all in pursuit of the ultimate quality tone. It is specifically designed for silent guitarists who are keen on honing their skills off-stage first before breaking out into the main scene later on. The built-in chromatic tuner features fine-tuning as well as an easy-to-read and accurate display. High-quality natural dynamics and warmth of previous tube amps. It’s fully loaded with updateable features through its USB connectivity. Fits perfectly in any kind of setting i.e workplace, domestic etc. Can alternatively be powered by AA batteries, which offers approximately six hours of nonstop play. Comes separately with individual volume keys. Irritating buzzing once the acoustic guitar is plugged in. The Roland AC-60 is an innovatory compact stereo acoustic amp that makes use of trailblazing digital signal processing so as to deliver crisp clean sound accompanied by a multiband/stereo chorus. With the following features, this amp proves that it is worthy of a spot among some of the best acoustic amplifiers in today’s competitive market. It is great for on-stage performing and off-stage practicing. Its design is less-complicated and attractively solid. Comes with a variety of impressive sound effects such as delay, reverb etc. Hisses quite often, which is typical of most Roland devices. On vocals, you can only select reverb from the wide array of sound effects, which is, to say the least, pretty substandard. 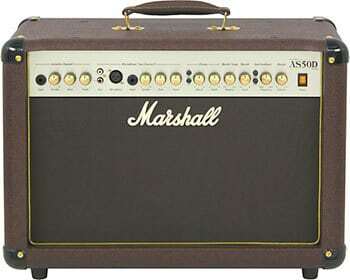 The Marshall AS50D is a very popular and all-around 2-channel and 50-watt amp that serves as a mini-PA system and an acoustic guitar amplifier. If you need to play and sing simultaneously in smaller venues, this is the amp for you. The XLR mic input is equipped with phantom power, thus making it possible to use both live condenser microphones along with dynamic mics. Incredibly versatile and can be recommended for solo gigs. Works perfectly in small-medium sized venues. Great chorus and reverb effects. The knobs offer poor control quality (some might even fall off). It lacks a 1/8” input for iOS and Android phones. 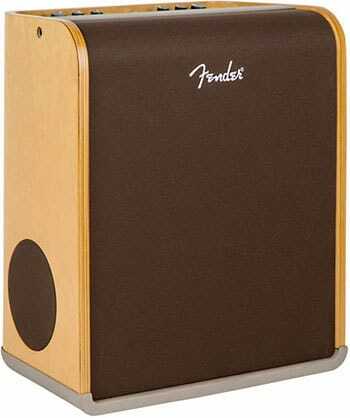 When it comes to the manufacture of quality acoustic guitar amplifiers, Fender means business. 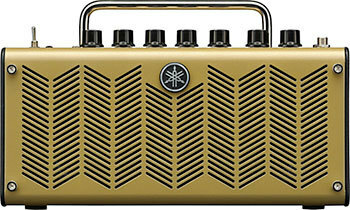 The Fender Acoustasonic 40 could indeed be a very reliable device in amplifying microphone inputs and acoustic guitars. It is a quick run-to amp when it comes to public address applications as well as musical performance. When combined with a PA system, the Fender Acoustasonic 40 can alternatively be used as an onstage monitor. It produces an astonishingly big sound for an amp of its size. Light-weight (16.2 lbs) and very handy. Though it is loud, it’s not as loud as it needs to be for huge performances. The bass is not powerful enough as compared to other amps. This is one of those amps that incorporates character and vintage tone to its rich and clean sound. It’s not the best option on the market, but it certainly gets our pick as the best cheap acoustic guitar amp on the market right now. Built to last long due to its external material (durable vinyl and high-grade wood). 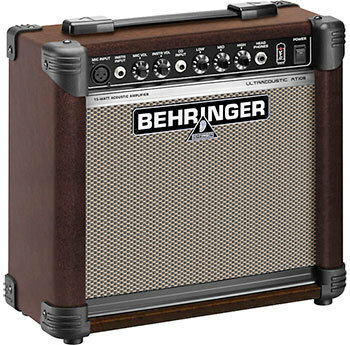 The Behringer AT108 amp lacks volume control for the line input. Additionally, the volume is not loud enough for large venues. When it comes to musical instruments (or music in general), not everyone shares the same taste. The larger the crowd you’re performing for, the more the need to put all your thoughts and musical skills to determine which acoustic guitar amp is the right fit for you. Additionally, it’s extremely important to point out that you should be the one to choose your own instrument. If you wish to get expert advice, by all means, go right ahead.